We provided the families of Mukuru, Kenya with clean water after a fire destroyed water infrastructure there. We are planning to provide 20,000 people in Kibagare, Kenya with pure, potable water. Let's get Water For Kenya. The village of Mukuru, home to 300 families and a small school, needed a sustainable clean water source. A series of unexpected events unfolded during our project in Mukuru. While we were identifying a water source for the community near the Ngong River and studying potential designs for the water treatment facility to be installed, community leaders informed us of a hostile fire that had been ignited the previous night. Flames had spread to the edge of the campus of the Reuben Vision School and to the BioCentre®, home to the village's water tank. The fire destroyed many homes, dormitories, and buildings, including the tank and plumbing system at the community's BioCentre. 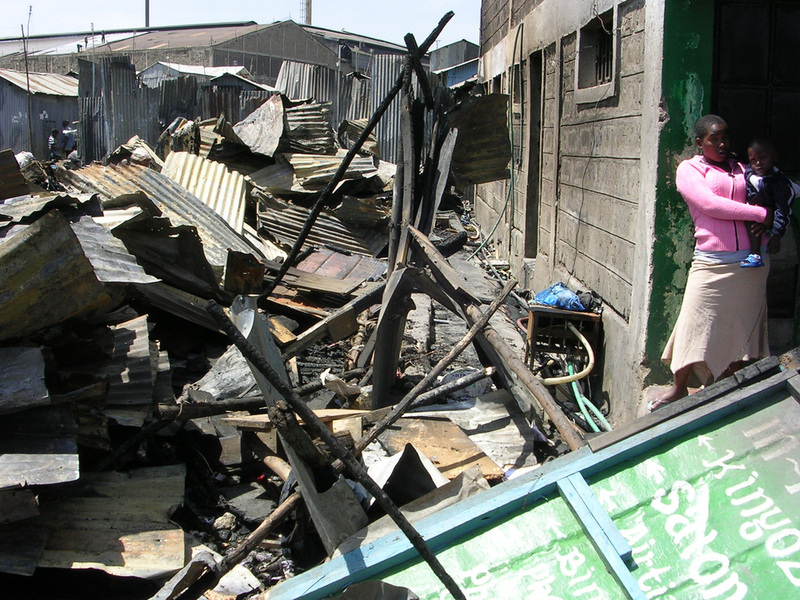 Thankfully, no one was injured, but the fire destroyed Mukuru's only source of water. TOHL projected a solution to this water crisis within 48 hours. Dean, TOHL's Kenya Project Manager at the time, quickly mobilized his team, who was able to install new piping in less than a day and the tank and the remainder of the plumbing within 48 hours. In conjunction with community volunteers, TOHL restored the drinking water and bathing facilities to their original capacity for the over 300 children and orphans that attend the school. After being notified of the emergency, the TOHL team on the ground took a quick inventory of the situation and subscribed an immediately implementable solution. The team conducted rapid re-design of the system, performing calculations, purchasing equipment, and installing new equipment in less than 48 hours. Education in the responsible use of water. Fee payment for system durability. Maintenance of the system from a technical perspective. The slums of Kibagare are home to 20,000 people without clean water or sanitation systems. Located west of Nairobi, Kibagare is densely populated and has become a breeding ground for water borne diseases. The local community of Kibagare needs clean water as soon as possible. We are in a position to provide ALL of Kibagare's community with clean water. You can help us get this project off the ground by supporting our campaign HERE (link coming soon).